1) Log into Footnote.com and select BROWSE, NEWS AND TOWN RECORDS, CITY DIRECTORIES, ILLINOIS, CITY DIRECTORIES--CHICAGO. 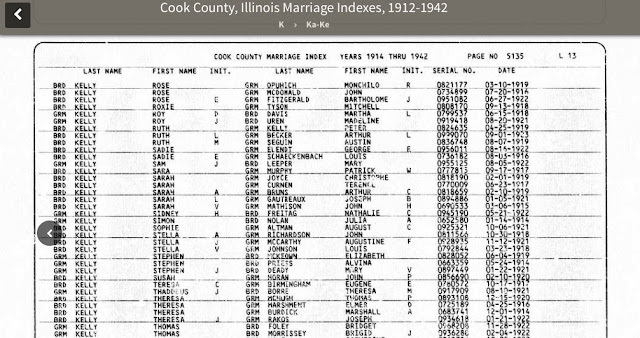 If you want to search every year available, scroll down and type in your key word(s) in the "Search within: News and Town Records » City Directories » Illinois » City Directories - Chicago IL" box. If you want to search a specific year, read on. 2) Click on the year you want to search. Then, type the surname you're looking for into the "Search within" box at the bottom of the screen. Scroll through the results until you find one that is close to the name you're looking for. "1843 » Rhines, Henry (p. 23)" will bring you to a page that begins with Rhines, Henry. If you were looking for "Roth" or even "Smith," you could navigate to the Rhines page and then use the small thumbnail navigation bar at the bottom of the screen to quickly locate the page you really needed. The rollover feature makes that easy to do. But don't just limit your searches to names. Over the Christmas holiday, I had the pleasure of starting a small curiosity project of my own--trying to find out more about a Boston violin maker named John S. Allen--and searching known business and home addresses allowed me to find others who were working and/or living at the same addresses--though not necessarily working in the same business or living in the same apartment. I also tried searching "violin maker" and "violinmaker" (they brought up different entries) to see who else might have been working in the city in the same year.